Junko “J.J.” Joho, baking teacher extraordinaire and a dear friend from Tokyo, came to Boston to teach a few cooking classes in my home. Her specialty is western style cakes and pastry, but she also makes wonderful Japanese desserts. She delighted the students with this contemporary combination of strawberry, red bean paste, and mochi dough. This confection does take a little bit of time and technique, but if you want to try something new, and don’t mind a little clean up, it is well worth it. a dumpling. 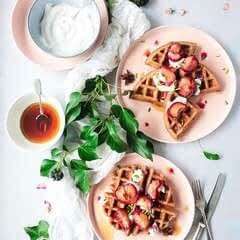 Choose flavorful medium size strawberries that will be easy to handle. 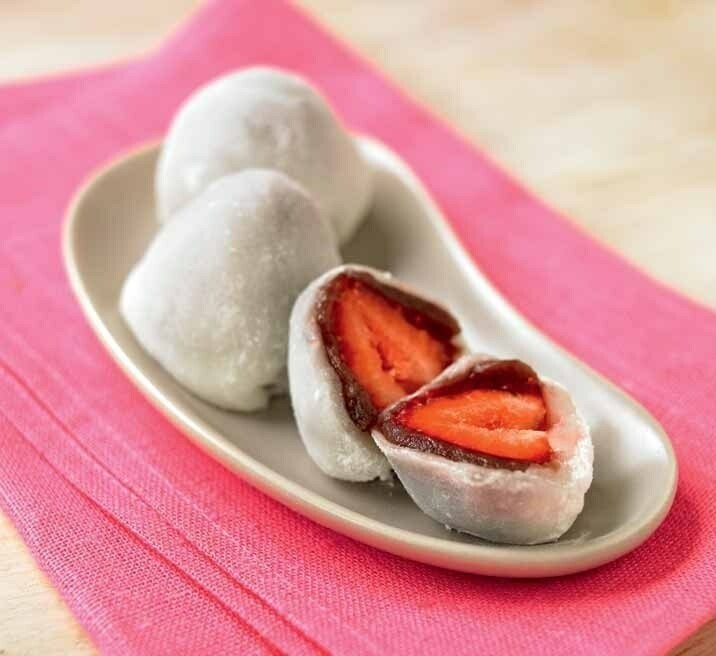 The strawberries are enrobed in sweet bean paste and then wrapped in the mochi dough. Use the smooth adzuki paste (koshi-an) that comes in a pouch. If not you can make the paste from a can of adzuki beans (p. 164). 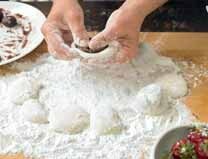 The trick to easy handling of the dough is cornstarch (not white flour) on your hands and work surface. The excess cornstarch is brushed off the confection before eating. J.J. made these in the palm of her hand, but she’s an expert! I found that using a mini cupcake tin, to hold the dough and strawberry, was helpful to pull up and pinch the edges of the mochi over the strawberry. NOTE If you are unable to find smooth sweet red bean paste in the package you can make your own with a can of sweet adzuki beans. © 2019 Debra Samuels / Tuttle Publishing · Reproduced with permission. 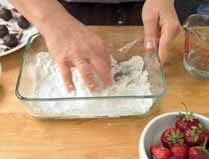 1 Remove the stems from the strawberry, rinse, pat dry with paper towels, and set on a cookie sheet to dry. plate in the microwave and heat for 30 seconds. Remove the plate. Mix the bean paste with the knife and microwave for another 30 seconds, this will evaporate some of the moisture and make the paste easier to handle. e paste should not feel too dry or too sticky. 3 Make 16 balls, (2 inches/5 cm wide) from the bean paste. Set them on a plate and cover with plastic wrap and refriger- ate until they are ready to use. 4 Drizzle the oil into a medium size microwave safe bowl. With a paper towel, coat the entire bowl with the oil. Wipe out any excess. 5 Combine the rice flour granules (shiratamako) and water in the bowl. Mix with your fingertips. Add the sugar and mix together until smooth. Heat for 2 minutes in the microwave. Remove and mix with a rubber spatula. 6 Place the mixture back in the micro- wave and heat for another 2 minutes. Remove and mix well. e batter should be smooth. Heat the mixture 2 more times in 30-second increments, stirring between each heating. e batter will be very sticky. the surface and sprinkle it with more cornstarch. e dough will be hot and you will need to work quickly. Knead gently for about 30 seconds. e surface will be smooth and the dough should feel soft, like the tip of your earlobe. With your hands, gently roll the dough into a thick log (about 12 inches/30 cm). is will feel like play dough. Cut the log in half and then cut each half into 8 pieces for a total of 16 pieces. Cover lightly with plastic wrap. 8 Have on hand a cornstarch dusted baking sheet. Set the bean paste and the strawberries on your work surface. 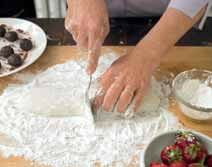 Dust your hands with cornstarch. Pick up a piece of the mochi and flatten it into a disc and stretch it by pressing the edges with your thumb and forefinger. 9 Set a ball of bean paste on the circle and flatten it almost to the edges. Take a strawberry, tip side down, and set it onto the bean paste. 10 Now gently stretch and pinch the dough over the bottom of the strawberry enclosing the berry. Pinch the dough together until sealed. Turn the strawberry over and lightly roll in you hands to smooth the sealed edge (like making a ball). Dust lightly with cornstarch. Loosely cover with plastic wrap. Repeat with remaining ingredients. 1 Flatten the ball of bean paste. Mold it around the strawberry from the bottom up, leaving the tip of the berry exposed. Repeat with remaining strawberries. 2 Sprinkle cornstarch into each mini- cupcake tin depression, and, with your fingers, coat the sides with cornstarch. Take one mochi ball and flatten it into a disc about 2 inches in diameter. Set the mochi into one cavity. Place a strawberry, tip side down, onto the mochi. Pinch the dough up and over the bottom of the strawberry, stretching the dough as you go and sealing the dough on the bottom. Carefully lift it out of the tin and set on a cornstarch-dusted platter. Repeat with the remaining ingredients. 1. In a microwave safe bowl or dish add the water to the shiratamako. 2. 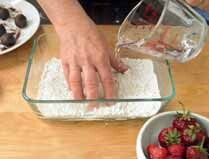 With your fingers, mix the rice flour and water until the granules are dissolved. Then, mix in the sugar until smooth. 3. After heating the dough in the microwave, pour onto the cornstarch dusted surface. 4. Form the dough into a log and cut into the dough with a spoon and divide into 16 pieces. Cover with cornstarch. 5. 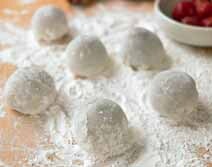 Flatten the dough into a disk and set a ball of red bean paste into the center flattening it as well. 6. Set the strawberry, tip side down, into the bean paste. Bring opposite edges of the mochi up and over the strawberry. Pinch closed. 7. Turn the strawberry over and lightly roll in your hands to smooth the sealed edge (like making a ball). 9. 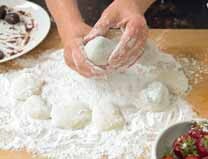 Make sure the dumplings have a light dusting of cornstarch on them until you are ready to serve. is more readily available at most Asian markets and now at some supermarkets. This dough will require more time when heated in the microwave. It is soft and when mixed, resembles mashed potatoes in texture. 1 Mix the rice flour, water, and sugar in a medium size microwave bowl. 2 Place the bowl in the microwave and heat for 90 seconds. Take out the bowl, mix with a spoon, then return to the microwave. 3 Microwave for another 90 seconds. Remove from the microwave and mix with a spoon. e dough will be very sticky but it will hold together. Heat for 30 seconds. Remove from the microwave. 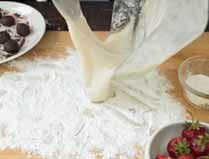 4 Cover your work surface generously with cornstarch. 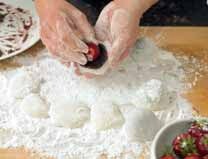 Turn the mochi onto the surface and sprinkle it with more cornstarch. e dough will be hot and you will need to work quickly. Knead gently for about 30 seconds. e surface will be smooth and the dough should feel soft.. With your hands, gently roll the dough into a thick log. Cut the log in half and then cut each half into 4-5 pieces for a total of 8-10 pieces. Cover lightly with plastic wrap. 5 Follow the procedure to wrap the red bean paste, strawberry, and mochi as above.